This is the third in a series of posts about the WinchBiz unconference, which takes place on Friday 2nd March 2018. 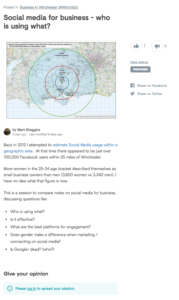 In case you missed them, the other two posts were Introducing WinchBiz and Arrangements for the #Winchbiz Unconference. The CitizenLab project aims to make it easier for anyone to suggest ideas to the council, and to indicate whether they support ideas or have related comments. This means that anyone can have their say, and it also helps WCC to understand which issues are important to the citizens and businesses. So far, CitizenLab has been tested internally at the council, and WinchBiz is being used as the pilot so that people can try it out ‘for real’ ahead of the unconference. Winchester City Council is inviting unconference participants to view and sign up to CitizenLab in order to promote ideas for sessions. I’ve had a go already – how about you? The remainder of this post shows a few notes and screenshots on what you will see when you first access CitizenLab. Click ‘Discover this project’ to see more details. You can click the tabs to step through different stages of the project, and see a list of ideas already suggested. If you click on an individual idea, you will then be presented with more detail about that idea. This is a screenshot of an individual idea. If you like an idea, you can give it a ‘thumbs up’, or ‘thumbs down’ and – if you register / log in – you can also add comments, or suggest an idea of your own. Got an idea for an unconference session? You do? Excellent. You can of course pitch it at the unconference on 2nd March, but if you’d like to give your idea an early airing, than you can also raise it in CitizenLab. Note that you will need to register in order to create an idea. Ideas raised in Citizenlab can help inform session pitching at the unconference, and we will link back to CitizenLab from the WinchBiz session grid and notes for any associated ideas. Once the unconference is over, we will add links in Citizenlab as comments against the original ideas, so you can see how the discussion went at the event. Consultation processes are vital for seeking views about a specific project, scheme, proposal etc, and are widely used throughout the Public Sector. 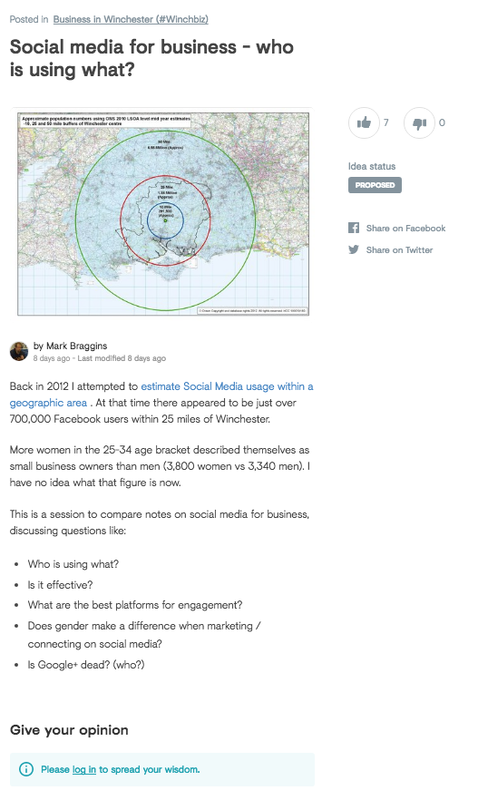 It’s great to hear that, alongside its normal consultation portals, Winchester City Council (WCC) is exploring other ways to engage with the people and businesses it serves. I hope this quick introduction to CitizenLab has made sense. If you have any questions, please leave a comment or, if you prefer, suggest it as a topic for discussion on CitizenLab.